The patellofemoral joint space is preserved. There is signal abnormality within the pateller cartilage and to a lesser extent, the pateller body, consistent with moderate chondromalacia. No significant effusion is seen. the retinaculae are intact. There is no significant baker's cyst. The anterior and posterior cruciate ligaments are intact. Signal abnormality is noted along ht course of the anterior cruiate ligament, consistent with underlying ACL sprain. A complex tear is seen within the posterior horn, body medial meniscus. Mild myxoid degenerative signal is seen within the posterior horn, lateral meniscus. There is a mild thickening of the medial collateral ligament, suggestive of underlying chronic change. There is no acute injury to the collateral ligaments. No significant effusion is seen. 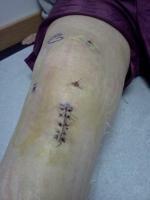 My orthopedic surgeon has recommended surgury to repair damage to knee. Is there any exercise program/treatment that I can try prior to surgury? I can walk with some pain mostly on the inside part of my left knee. After sitting for a long period, or sleeping, my knee seems to lock and pain increases. Once I stretch my leg and flex my foot up and down, the locking/pain gets better. It should be noted that my knee problem worsened about 10 days ago when I hyperextended my knee.